Pick two red numbers between 1 and 26, and two white numbers between 1 and 26, or tell the clerk you want a 2by2 quick pick. You can pick up to 5 different sets of numbers on each play slip. You can purchase the same numbers for up to 28 consecutive drawings (4 weeks worth) when you use the multi-draw box on the play slip. Multi-draws can be purchased for up to 12 weeks. As of June 26, 2011, tickets can be purchased from 5:00 a.m. to 3:00 a.m. (Central Time) any day of the week except from 9:00 p.m. to 9:03 p.m.. Drawings are conducted by the Multi-State Lottery Association. The winning numbers are announced Monday through Sunday in time for the ten o'clock news. Get winning numbers here, from nelottery.com, your favorite radio or television station, a Nebraska Lottery Lotto retailer, your local newspaper or USA Today, or on the Players Hotline at 1-800-224-LUCK (5825) or in Lincoln at 402-471-6139. If you purchase a ticket for 7, 14, 21, 28, 35, 42, 49, 56, 63, 70, 77, or 84 consecutive Multi-draws, your ticket qualifies for the free 2by2 Tuesday feature in which all prizes won on Tuesday automatically double in value. 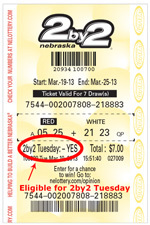 Any Multi-draw selection that is not divisible by 7 is not eligible for the 2by2 Tuesday feature. Matching one number wins a free quick pick play. The free quick pick play prize is for one (1) 2by2 quick pick play, which will automatically print after the ticket is validated. A free quick pick play prize will be good for the next drawing. You cannot pick your own numbers on the free quick pick play prize. If you win the free quick pick play prize on Tuesday from a qualifying 2by2 Tuesday purchase, you will win two free $1 quick picks. * The maximum grand prize liability is $220,000 per Sunday, Monday, Wednesday, Thursday, Friday and Saturday draw, up to ten (10) grand prize winners of $22,000. The maximum grand prize liability is $440,000 per Tuesday draw, up to ten (10) grand prize winners of $44,000 each. If there are more than 10 grand prize winners in any one drawing, then prizes will be awarded on a pari-mutuel basis.